Is there a competition for insanity or does it come naturally to those in government? Are decisions taken alone or in consultation? Do a handful voted for a term in office have the right to do as they please not caring a fig about opinion of others? 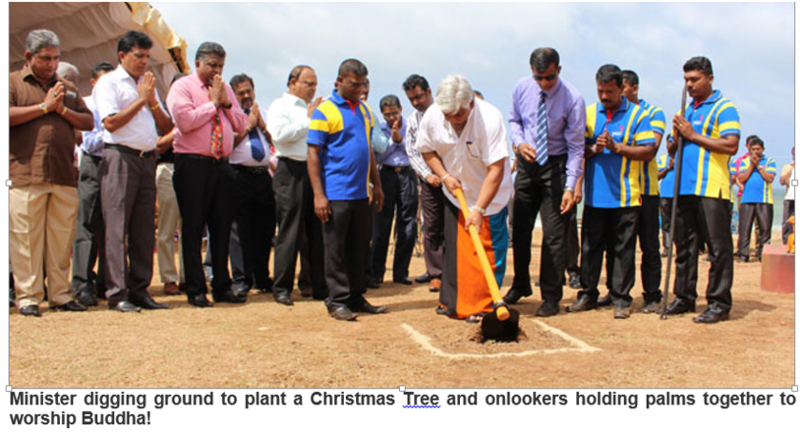 A huge area in the middle of Galle Face Green, a place for the ordinary public to play and meet is being dug to plant the ‘world’s tallest Christmas Tree’ a brainwave of a Buddhist MP when the Catholic Church banned Christmas trees in 2015 claiming there was no religious significance. If the Christmas Tree is not liturgical symbol in a majority Buddhist country why is a Buddhist MP wanting to allocate public space to plant the world’s tallest Christmas tree? So what multiculturalism and co-existence is there in planting a tree that is not even a Christian symbol in the middle of Galle Face Green? We are fast becoming if we have not become already the laughing stock of the entire world! There is no mention of Christmas in the Bible, nowhere does Jesus ask to observe Christmas, we should by now know that Santa Claus is a lie traditionally followed, If Jesus was not born on 25 December (it is in reality a pagan holiday honouring the pagan sun god) it means people are celebrating a day that Jesus was not even born in. No wonder Christians are leaving Christianity in the West! But we all know Christmas is the businessman’s windfall and businesses make the most profits during Christmas season and it is for this reason only Christmas will remain! So how did Christmas come to be celebrated on 25 December if it is not the birth date of Jesus? In 1466 Pope Paul II forced Jews to race naked through the streets of the City as part of the Saturnalia carnival. (David I. Kertzer, The Popes Against the Jews: The Vatican’s Role in the Rise of Modern Anti-Semitism) In 1836 the Jewish community sent a petition to Pope Gregory XVI begging him to stop the annual Saturnalia and abuse of Jews. The Christmas tree was also a pagan worship which also came to be adopted by the Church. Clement Miles, Christmas Customs and Traditions: Their History and Significance covers the origins of mistletoe which was a Druid ritual using mistletoe to poison their human sacrificial victim, while the custom of ‘kissing under the mistletoe’ he says was another sexual license of Saturnalia by Druidic sacrificial cult. Miles also claims that origins of Christmas presents derived from emperors compelling their most despised citizens to bring offerings during the Saturnalia and the Church gave a Christian flavour by associating it was the gift-giving of St. Nicholas. Nicholas was born in 270CE in Turkey. He became the Bishop of Myra and was one of the senior bishops who created the New Testament in 325 CE portraying Jews as ‘children of the devil’. He died on 6th December 345CE. He became a saint in 19th century. In 1087 some sailors moved his bones from Turkey to Italy where Nicholas became a cult and soon spread to Germany and among Celtic pagans. Soon those who had been worshipping pantheon led by chief god Woden incorporated his long white beard and flying horse with Nicolas. Thus, this cult was adopted by the Church and instead of distributing gifts on 6 December it was changed to 25th December. In 1809 novelist Washington Irving wrote a satire referring to the white bearded flying horse riding St. Nicholas using the Dutch name Santa Claus. It is believed that Dr. Clement Moor professor at Union Seminary portrayed Santa with 8 reindeer in 1822 while Thomas Nast drew more than 2200 cartoon images of Santa for Harper’s Weekly in mid 1860s projecting Santa as living in the North Pole, with a workshop filled with elves. Santa’s red cloak came after Coca Cola Corporation contracted Haddon Sundblom, a Swedish commercial artist to create a coke-drinking Santa in 1931 and Santa ended up with a red cloak. 16 elements are needed for its growth – hydrogen, carbon, and oxygen. Nitrogen, phosphorus, potassium, calcium, magnesium, sulfur, boron, copper, chlorine, manganese, molybdenum, iron, and zinc are obtained from the soil. The fools riding on the bandwagon of reconciliation and multiculturalism are making a mockery of the country and we are being laughed upon even by the very parties that are throwing these foolish ideas that our politicians are implementing. These fake socialists are actually paid underhand by the US, EU,UK,Canada, Sweden, Norway and India’s secret services millions of US dollars via NGO’s to support Eelamists LTTE terrorists, the TNA and the separatist terrorists. The socialist label is used here to hoodwink the gullible people into thinking that they are really socialists but they are not. They are heavily dependent on thousands of US dollars for their survival. The Frontline Socialist Party too are receiving millions of US dollars from the Green Party of Australia (who are staunch Eelamists who supported the LTTE terrorists and they support indirectly US,EU.UK, Canada, Norway and Sweden’s imperialism although they call themselves ‘green again to hoodwink gullible people’). The others are also dependent on thousands of US dollars. It is these people along with Dr.Nirmal Ranjith Devasiri, the JVP rathu ali patiya’s (who have become lackeys of the UNP and US imperialism again for lakhs of rupees), Jehan Perera, Pakiasothi Sarvanamuththtu, Prof Sarath Wijesuriya, Wickramabahu Karunaratne and the like who brought about this ‘regime change’ in order to help US imperialism fulfil their devious aims within Sri Lanka. What US imperialists have learnt and have practised in many other countries is to precisely use such fake socialists, fake trade unionists, fake student’s organisations and fake green activists to hoodwink enough gullible people so that patriotic, socialist and real environmentalist governments are deposed, regime change brought about and separate states created to fulfil US imperialisms nefarious aims. In Sri Lanka a huge NGO network, funded using millions of US dollars, was used to bring about regime change. Thank you Shenali for going from the sublime to the ridiculous. One wonders whether some of our Ministers have any brains. How is the Christmas tree going to survive in the hot sun? Normally Pine trees used as Christmas trees grow in the temperate climates. Is he going to build a glass case around it and air condition the plant?There are so many priorities that this idiot has no other ideas other than to plant a Pine tree in Galle face? Why is everyone around the first idiot behaving as idiots also by worshiping the idiotic Minister? The one with the Udella is worth stripping naked and hanged up on the Christmas tree. Oh ! wait ! is he planting a Bo Tree ? the way the surrounding fools worshipping with hands held together. 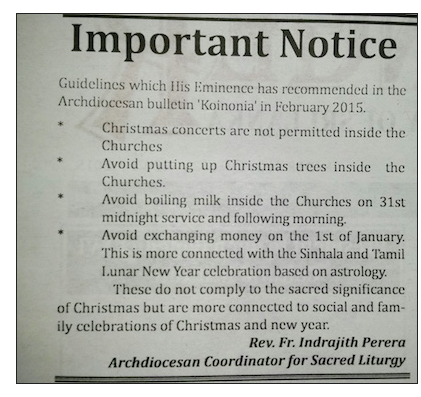 No one protests about the celebrations during Christmas – so why the big show here ? Planting a X’mas Tree in Galle Face Green speaks of a heightened sense of insecure feelings, with worship/longing for lots of Goodies, as during X’mas time ? May All the people at this ceremony get Green Cards to US or Perrmanent Visas to Canada or Britain/Europe – they belong there, they are happy out there, not in Lanka. PS: Scientists have proven that Christ was born during the month of June not December. December may have been chosen by the west to make a festival happen during cold winter months. But to plant a X’mas tree in the middle of GFG …. ?? Sudda racists are against multiculturalism making life difficult for the minorities to safely and peacefully live in their country.So are we taking lessons from them and do the same in our country? When ever a politician or anyone speak in favor of multiculturalism we minorities feel safe and secured. There fore we must not legitimize racists by talking or writing against multiculturalism which is the order of times ahead,if we are to live peacefully in the country of the suddas. I sometimes think if some writers are in favor of the nasty type of future colonialists who may not be benevolent as our British colonialists,the way they right against all values that should be upheld in a multi ethnic countries. For argument’s sake we forcefully repatriate the recent immigrants to our country in the last 125 years, then the politicians will exploit, make up or artificially create fears of the indigenous and deport the ethnic minorities from the Western countries,as we have set a bad precedence for them to exploit.We have to be mindful not to create a precedence as the politicians will find a way out of any crisis that would be created by housing shortages,unemployment etc. We will like to watch the likes of Trump emerging into nasty leaders that may spread,if catch on so don’t make that day any closer.As good Buddhists,Christians or whatever,must not get into that school of thought where we can’t live peacefully among communities where tolerance,respect and even human rights should be in our forefront. This entry was posted on Wednesday, August 31st, 2016. You can follow any responses to this entry through the RSS 2.0 feed. You can skip to the end and leave a response.